Any reports yet about which type design software breaks under macOS Mojave? hdiutil attach FontLab.sparseimage -mountpoint "~/Library/Application Support/FontLab"
Aha! This is interesting and possibly explains the weird situation on my MacBook. I'm running FLS5 for Windows in a virtual machine under High Sierra, and the macro order is messed up as you describe. It didn't cross my mind that it might be an issue from the Mac file system side, but that explains why I don't have the same issue on my iMac running Sierra. The virtual machine is not using the apple file system. So there has to be another issue. And Glyphs runs find in Mojave. Only the dark mode is disabled. The virtual machine is not using the apple file system. The only difference between the setup on my iMac and MacBook is the Mac OS version. Everything else is the same, and the issue with macro ordering in menus in FLS5 is exactly as Jens describes. FontLab VI runs fine in Mojave as far as we can tell. Although running FontLab VI in Mojave under a VM can cause trouble, at least under VMWare Fusion. Only the dark mode is disabled. I know it's probably not a priority, but Glyphs dark mode sounds cool. It will get it eventually. FontLab VI may get dark mode eventually, but not right away, either. It looks cool, but it has complications—and we believe that mostly, people want to edit darker glyphs (or darker outlines) on a lighter background. We don't see any major functionality that is enabled by dark mode, so we are going to concentrate on more pressing things first. I just found out that there are some performance problems in Mojave. It seems to be caused by code from Apple. I’ll investigate. I agree. But it doesn’t have to effect the background, but only UI - like the mail app have an option to disable it in the message window — turning it white. Does Fontlab V work fine with Mojave? I still use V with High Sierra but there is the glyph copy and pasteboard problem. Is there any way to fix it until I upgrade to VI? 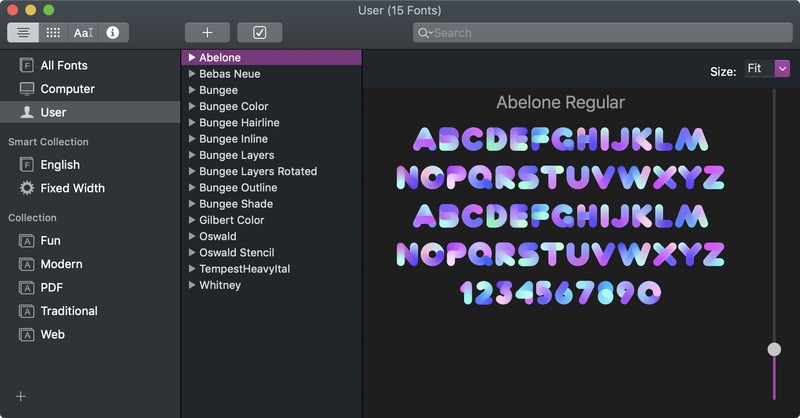 Does Fontlab 5 work fine with Mojave? I still use V with High Sierra but there is the glyph copy and pasteboard problem. Is there any way to fix it until I upgrade to VI? FontLab Studio 5 has problems on High Sierra and Mojave (10.13, 10.14). It may well not work at all in the next macOS coming in fall 2019 (10.15). These problems are described on our blog. The Windows version runs on Windows XP SP2 and newer, including Windows 10. FontLab VI works on Yosemite (10.10) and higher, including 10.14 and beyond. The Windows version runs on Windows 7 and newer, including Windows 10. There is no real workaround for the lack of "paste special"; the glyph copy/pasting problems can be worked around as described. FontLab VI runs on macOS 10.10 Yosemite and newer, including 10.14 Mojave and beyond.